Recently I gave my Gentle Readers a heads up on two new Zentangle books that are being released this week. They are the long-awaited, much anticipated Yoga for Your Brain a Zentangle Workout by Sandy Bartholomew, and Suzanne McNeill’s Zentangle 4. Well Suzanne’s publishing company, Design Originals, has obviously been very busy the last few months because there are two MORE new Zentangle books coming out this week. Four new books in one week. Wow! And you still have time to order them as Valentine’s gifts, or just because. 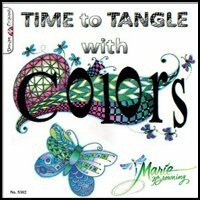 Time To Tangle with Colors by CZT Marie Browning is the first of these two additional new books. The second book is Clay Classics Inspired by Zentangle by Julie Eakes. Would like to know if any of the Zentangle Books are available for the ipad. Oh, I’m sorry I failed to say that your site is fantastic.